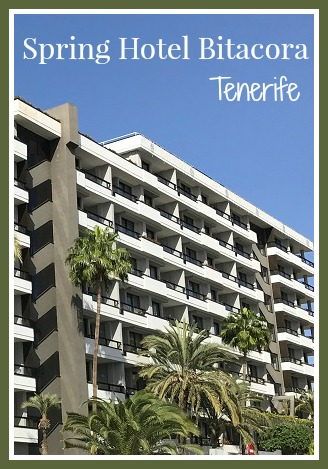 Over New Year 2017 we spent a week at the Spring Hotel Bitacora in Playa de Las Americas, Tenerife. We booked a package holiday with Thomas Cook, including flights and transfers, and we stayed for a week all inclusive. 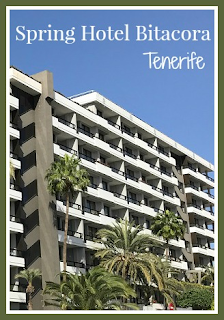 The Spring Hotel Bitacora is located in the resort of Playa de Las Americas on the Tenerife coast, just a few minutes walk from the main town centre and beaches. The hotel has free wi-fi throughout which was fast and with no limit on the number of devices you could connect. There was also a television with British channels like BBC although ours seemed to be stuck on audio descriptive mode, luckily we were able to manage without it! Our room was a standard room, which was spacious with twin beds pushed together to make a double, along with a sofa bed and an additional bed for the children. The bathroom had a large walk in shower (no bath), balcony, and you can rent a safety deposit box for 2 Euros per day. We had a lovely view from our balcony, across the play area just outside and a good view out to the Teide volcano (although a bit hidden behind the palm tree!). The outdoor play area is large with plenty to do including an aerial runway and climbing wall, all sheltered from the sun. There are also two smaller indoor soft play areas for younger children which are part of the Kids Club and accessed by a gate which was monitored by staff. We didn't use the Kids Club but there seemed to be plenty of themed activities going on. Every evening there was a Mini Disco at 8.30 pm with all the classics that we are familiar with from similar holidays elsewhere, then there was further entertainment later on in the evening, although ours couldn't stay awake that late. Harry and I played bingo one afternoon which was fun although a bit embarrassing because we kept winning - I now have a huge stash of branded T-shirts, caps and bottle openers! There was also daily entertainment by the main pool, along with inflatable water slides on some days. There are two pools in the hotel - a shallow children's pool and a deeper main pool. Unfortunately the children's pool isn't heated and it was far too cold to go in during our stay in January. In the photo below you can see a couple of hardy souls, but it was generally deserted which was a bit of a shame. There's a slide too but again no-one was using it. The main pool was slightly warmer and we were able to manage a short swim. We found that the outdoor temperatures in January were very pleasant, much warmer than I had been expecting, and definitely warm enough to sit out around the pool and soak up the sunshine. We did have a bit of wind on a few days, but in a sheltered spot it was fine. Our room reservation included pool towels which could be changed during a daily hour long slot. There seemed to be plenty of sun loungers, although it might be different at a peak time of year. We always managed to find somewhere to sit, albeit it often tucked away at the back as the pool side loungers were generally always occupied or reserved. We aren't particularly foodies, and being vegetarian means that we didn't sample most of the food on offer, and we also tend to stick to the plainer choices. There was always a vegetarian dish although they could get a bit samey with quite a lot of pasta. There were plenty of salads, fruit, bread and cheese and a separate children's buffet in the evening with chips, tomato pasta, chicken nuggets and that sort of thing. We were there for New Year's Eve when a special dinner was served, and you can see more of that in my video at the bottom of this post. My favourite new food was the red and green pesto cheese which I've never tried before - it made an appearance on subsequent days too which I was very pleased about! The hotel had fireworks for New Year's Eve, and although we weren't able to keep the children up until midnight to see them we were able to enjoy displays from neighbouring hotels from our balcony. There was always a nice selection of desserts and cakes, along with an ice cream bar. The photograph below was taken on the evening before Three Kings' Day (January 6th) so it was a bit more special, and I very much enjoyed the biscuit pizza! There was also food available during the day in the bar by the pool, where you could have a burger and chips or make your own toasted sandwich. Unfortunately everyone apart from me did get ill on our holiday at some point with a tummy bug, which took out several days of our holiday. 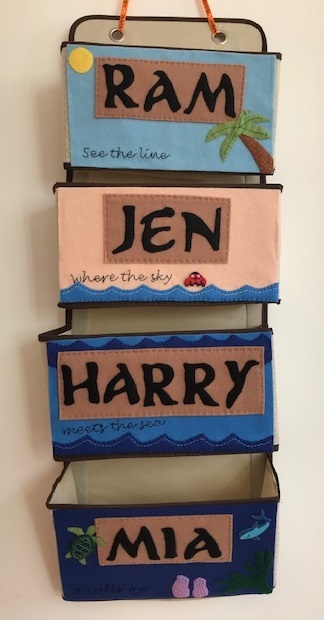 I don't like to blame the hotel, but I did feel that the hygiene wasn't as strict as I've seen on holiday before, perhaps because I'm comparing it to cruise ships where the hygiene is top notch. We washed our hands regularly and there was a hand sanitiser at the entrance to the restaurant but no-one was using it, and there was no signage to remind people about hand washing and so on. There weren't any staff watching out to make sure that people weren't serving themselves food with their hands for example. The all inclusive included a good variety of drinks, including soft drinks, and a fair few alcoholic drinks and cocktails. We aren't big drinkers and we found that the selection was more than enough for us. We were given a bottle of champagne at dinner between us on New Year's Eve, and there was also champagne available every day at breakfast if you fancied it! The town centre of Playa de Las Americas a very short walk away is bustling, with plenty of shops and restaurants. You can reach the coast via many different routes and there are several beaches within easy walking distance. The very closest are stony beaches, with interesting rocks to climb and rock pools to explore. Not much further away are the sandy beaches, the large Playa de las Vistas and the smaller Playa del Camison. Both are fairly sheltered from the waves and have swimming areas, although the water was a bit too cold in January for me to do much more than paddle. The sand is good for building sandcastles..
We didn't eat outside the hotel but there seemed to be a good variety of different cuisines on offer in the town restaurants, and when we went into Playa de Las Americas in the evening it was buzzing with nightlife. The fountain has a sound and light show three times during the evening which was quite fun to watch, and all the Christmas decorations were still up everywhere. On the evening before Three King's Day there was a parade through the town, unfortunately as some of us were ill we didn't make it down there, but the Kids Club put on a little parade in the hotel before the Mini Disco which I took Harry along to, it was quite fun with plenty of sweets being handed out to all the children. I've put together a short video which you can see below, with a more detailed look at our room and balcony, the local beaches, the town centre, and some of the food that was on offer. If you have any questions about the Spring Bitacora Hotel I'd love to help, please do leave a comment below!